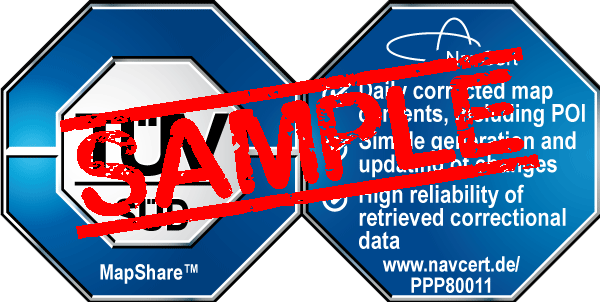 Testing and auditing of the MapShareTM service covered all key areas: structure, concept, operation and functionality, including data protection, security and integrity. The certification mark is awarded within the framework of voluntary testing and certification. It is defined for a service which allows for fast and simple change of routing or information about points of interest (POI) in navigation systems. It also provides users with a platform for the secure and reliable exchange of altered information. Testing and auditing verified that new information is available on a daily basis by means of technical and organizational measures and that this new data includes all significant changes related to roads and POIs. Testing and auditing verified that changes prepared by third parties can be easily entered, optionally sent, and retrieved. Therefore user interfaces were also tested and assessed.